Today I am learning to focus first, and most importantly, on my many blessings in this life, and to express my gratitude to God. 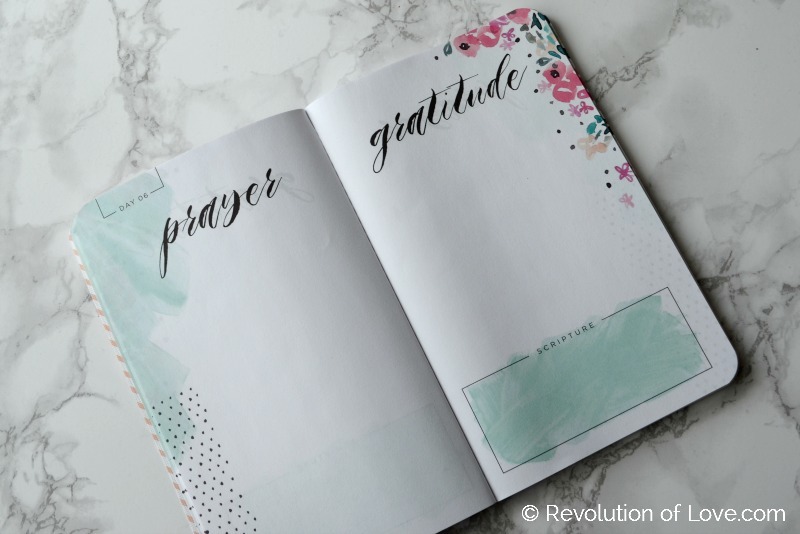 The image above is the actual style of the Gratitude Journal I am using ( you can get it from http://www.maydesigns.com/m/gratitude) and I really love it. It is simple, colorful, and is for 40 days…the perfect Lenten tool. If you are thinking of journaling at all, please check them out. They have all sorts of simple, and so pretty, journal ideas and styles. They were inexpensive and I love how you can customize your designs (inside/outside/monogram, etc). I get nothing for recommending them; a friend recommended them to me and I am so happy with the product I received, I thought I would share them with my readers. (It is an integral part of the Lenten study I am participating in with http://www.orthodoxmom.com). These journals will become, for me, a legacy of my journey this Lent, and each year that I can participate in this. What a blessing this has become for me! If you wish to, you can join us!! Lent is not over, yet! As I progress through my journaling, most especially my “gratitude” journal, I am brought up short again and again at how disfigured my thinking has been. Disordered. The priorities so very skewed. I keep thinking about all the things that weigh me down. There are many – we all have them! Sometimes we cannot sleep because we worry so very much. Or if we do sleep, we don’t sleep well or deeply. We do not sleep to where we awake restored, or refreshed, bounding out of bed and ready to conquer this day. My husband is an engineer. His specific training is mechanical, although he works as an energy engineer. When he is faced with a problem, especially something to do with his work or job, he does not stop thinking about it until he solves it. This can take days or weeks. And at times, I can tell he is not really “present,” but is working on his issue. He’s woken in the night with a solution once or twice. Over the past 32+ years of being with him, I am in awe about how dogged he is in seeking a solution for issues. 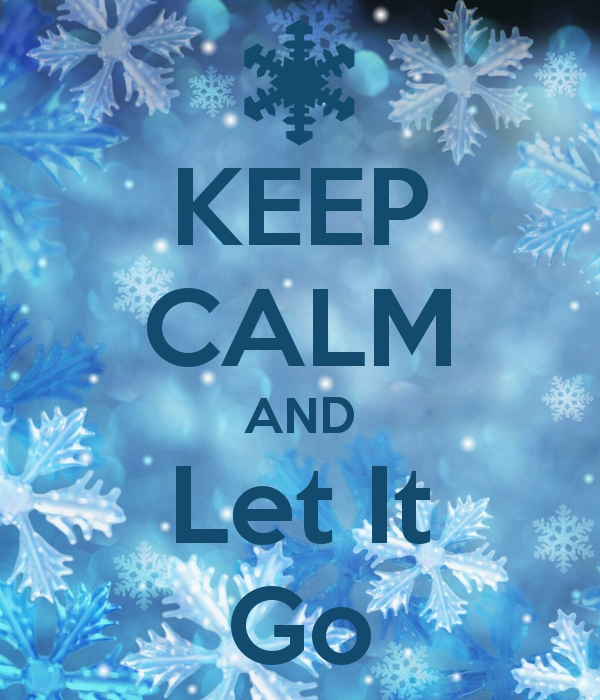 But sometimes his mind works against him, in that he cannot “let it go” in order to rest. He will approach any problem this way! Even how we were going to construct our raised bed gardens last Spring kept him from sleeping well! Some of us just cannot rest until we have the answers we seek. But I am learning and discovering a better way. Now that I am doing a directed Lenten study program, and I am slowly walking through the Psalms and the Scriptures in light of Lent, I am seeing how much there is to be grateful for. There is always, always, something we can be thankful for, even in the midst of turmoil. The problem with me is that I have been putting the problem, the issues, before everything else. I haven’t been able to see all the blessings, because the troubles have blocked my vision; my heart. And it has left me depressed and not aware of the glory that surrounds me in the simplicity of my days. It is hard to explain how much peace I am finding as I journal my gratitude, my desires, and read the Psalms and Scriptures. Sometimes I cannot see how they are related, but when I step back and ponder the readings, things start to click. Today I read, “Wait a little, and the wicked will be no more; look for them and they will not be there. But the poor will possess the land; will delight in great prosperity.” (Psalm 37:10-11) and then I read, “Better the poverty of the just than the great wealth of the wicked.” (Psalm 37:16) And then, “The mouths of the just utter wisdom; their tongues speak what is right. God’s teaching is in their hearts; their steps do not falter (Psalm 37:30-31). And one more that said, “Observe the honest, mark the upright; those at peace with God have a future, but all sinners will be destroyed; the future of the wicked shall be cut off.” (Psalm 37: 37-38). I think God is letting me know through the Psalmists that I am to struggle to find the right path; the path that God destined for me. “For I know the plans I have for you,” declares the Lord, “plans to prosper you and not to harm you, plans to give you hope and a future. Then you will call on me and come and pray to me, and I will listen to you. You will seek me and find me when you seek me with all your heart”. (Jeremiah 29:11-13) God blesses us as we work towards Him and His plan for our lives. And I truly believe that we can alter how we approach this working out of our salvation; that we can grow and become more than we currently are. What I think I have been doing wrong, is that I have been so concerned with keeping the rule of the fast in the past, of being holier than I am the rest of the year, of making sure I attended all the right celebrations and prayers at Church, that I was missing all the blessings I received from God through my fasting and prayers! By looking to my gratitude first, I can plainly see the blessings I have, and continually pray for the things that I feel I need to pray for, and about. 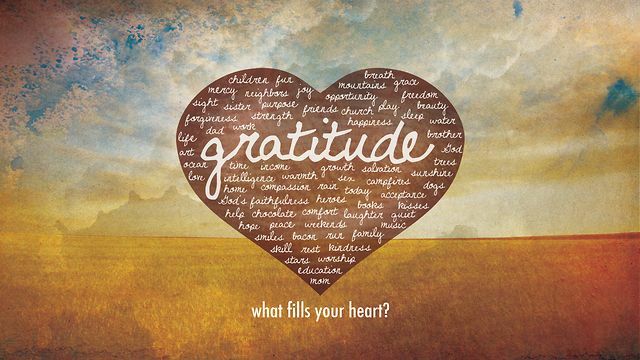 But when you put gratitude first, your prayers, your days, and your nights, become very different. And my prayer for this Lenten journey I am on is to continue to seek the positive in my life and to be grateful, first. To seek God and His blessings on my life, and to rest in His promises. And my prayer is that each of you who reads this will discover that gratitude can lead us to a much happier, and closer, walk with God…during Lent and each day of our lives. 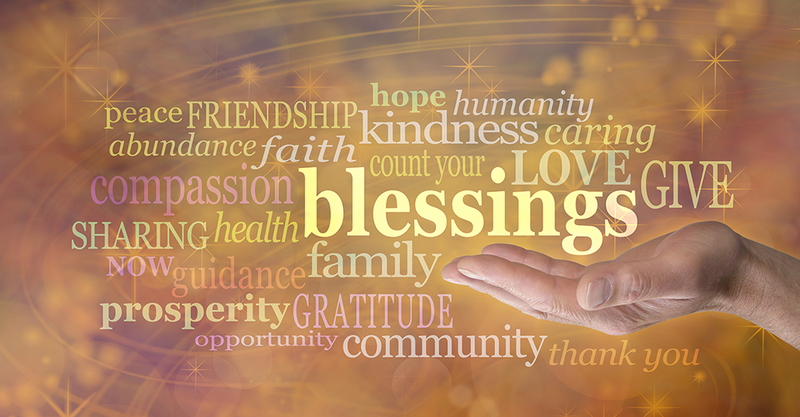 Think of all the wonderful blessings the Lord is showering down upon each of us, this very day. Each day we can rest in the many blessings from God, and each day we can work on lessening the concerns and the fears, trusting in God alone. 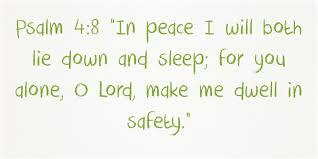 I am praying for a better night’s sleep for everyone. And every day when we rise, refreshed from our night of peace and rest, may our day be a better day, where we are accomplishing the things that are laid before us, in a spirit of Gratitude. So thankful! Spring is trying its hardest to arrive. We’ve had days and days of dark, wet, and gloomy, with record snowfall just 20 minutes north of here and avalanches (complete with rescues of stranded snow-shoers) as well as tulips and daffodils poking their lovely heads above the soil. 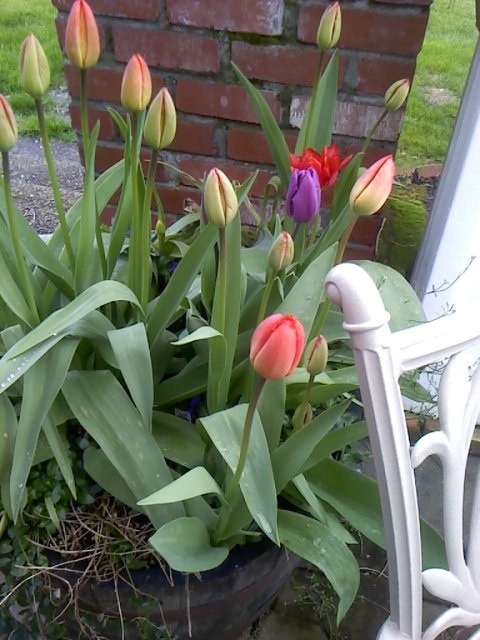 I have an old wine half-barrel on my patio that is loaded with tulips. They are struggling with the craziness of bright and sunny days followed by a string of rainy days. This morning is clear and cold…low 30s…and there is frost everywhere. We have a little Miniature Schnauzer whose name is Chet. He is so typical of the breed…strong willed, stubborn, and refusing to listen; typical terrier. 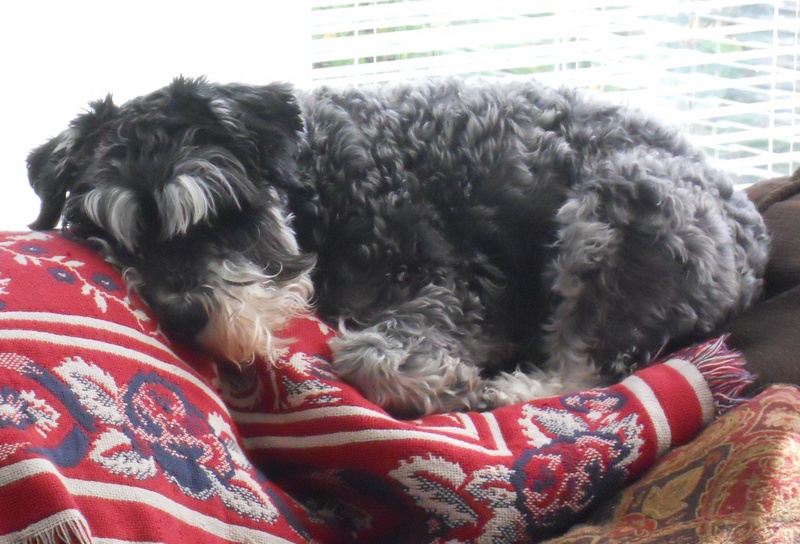 He loves to perch on the tops of the cushions of the couch, keeping an eye on the golf course behind the house. We live on the 14th tee box and when it is full of people, we have to do our best to keep Mr. Chet under control, as he thinks whatever he sees, he is the lord of. Today was no exception. He just sat on his perch, growling. I could not see anything out there that would make him growl, and was thinking that perhaps it was a left-over emotion. Last week, we had a scare with him. I had my cup of coffee; it was about 7:00 am and Chet was outside on his tether, doing his morning rounds. All-of-a-sudden I heard him yelping. I scrambled outside and at the base of our porch stairs was a coyote, with Chet in his mouth. I yelled and the coyote dropped Chet, who was whimpering and running towards me. That darn coyote stood under the copse of trees that front the 14th tee and just stared at me, almost daring me to go after him. Instead, I just yelled and waved my arms and he ran off. By then, I had a shaking, wet, terrified little terrier in my arms. This morning, however, his growl broke into barks and I raced to check out what had invaded his line of sight, and it was a little bunny! She’d been nibbling on my budding tulips and was hopping off the patio and out onto the golf course. Chet was having none of it and was barking his head off, shaking from head to toe. Boy oh boy, did he want out on that patio. I corralled him and we came to the other side of the house, where I have my office, and he is comfortably ensconced in his favorite spot. This morning is so quiet and peaceful and I treasure mornings like this! The birds are chirping and the sun is shining (even though there are black clouds to the east and the north) and little bunnies are hopping outside. It feels so wonderful. And then I see the chaos all around me as we finalize this move of ours. My stomach clenches and I realize I need to gird my loins for another day of wrapping our lives up into crates and boxes, making all sorts of annoying changes that are required when you move across town or across states. And even the peace of a spring morning can be darkened a little bit. Yesterday was an awful day for America, with the bombing in Boston. I wonder if it is terrorists or someone wanting their 15-minutes-of-fame. Regardless of the reasons or the perpetrator, people were killed (memory eternal) and others are in critical condition, while still others are coping with horrific injuries they will have to learn to live with. Life can take such turns in such a quick space of time. This was intended to hurt, not destroy. The coyote who grabbed my dog is emblematic of the terror that gripped these people. Feeling powerless and overcome by something bigger and stronger than you is a horrible feeling. I was so proud, however, to see how everyone reacted. So many did not run away; instead they turned to help those around them. So many first responders sprang into action. Boston was heroic yesterday and it made me realize that deep down, we are made in the image and likeness of God and it showed. Blessings upon blessings to those who rushed to serve others, with no regard for their own safety. It is amazing to me that tulips will be coming up, daffodils will be blooming, and there is a bomb. There is bright sunshine and on the horizon are the blackest of clouds. Our life is a dichotomy of light and dark, good and bad, spring and deepest winter. We have our days that are blessed and we cling to those times. We have our darkest and most horrid days, and for those days, we look for the heroic around us, seeking the sign that God is present in His people. I do love that quote of Mr. Rogers, because it exemplifies the struggle I am speaking to this morning. Working through the horrible right alongside the blessed. 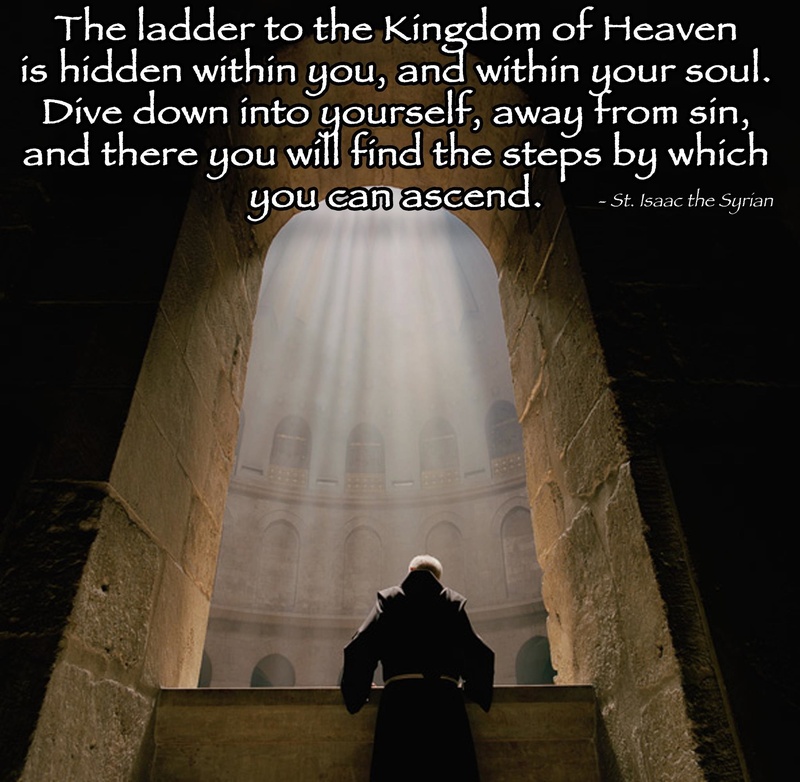 Our path to God is strewn with experience…some of the experiences lead us off the path He has laid for us, because we get caught up and lose our way. Some experiences help us to dig deeper and prepare our hearts to follow the path God prepares for us. He never has our destruction in mind, but always what is best for us. We are the ones who deviate and get lost. This experience for me, of a joyful spring morning juxtaposed with the dark clouds on the horizon; a barking little dog with the cute little cotton-tailed bunny hopping across the patio; the peace of waking to sunshine and birds chirping and the chaos of the move I am trying not to trip over! Then there is the joy in my heart at all my blessings compared to the disturbing, ongoing news about Boston…how do we reconcile all of this? I cling steadfastly to the promises of God. He warned me that He came to divide, not unite. (Luke 12:49-51) and that He came to cast fire upon the earth (Luke 12:49). But in this same chapter of Luke, He tells us to not be afraid (Luke 12: 22-31). He calls us His little flock and assures us “it is your Father’s good pleasure to give you the kingdom. Sell your possessions, and give to the needy. Provide yourselves with moneybags that do not grow old, with a treasure in the heavens that does not fail, where no thief approaches and no moth destroys. For where your treasure is, there will your heart be also.” (Luke 12: 32-34). And to these promises, I cling. I treasure the moments of peace and clarity. I notice the birds and the flowers, those moments when God is sharing creation with me. Those moments sustain us when the coyotes growl at the door and the bombs rip through a peaceful jog. God allows us to experience these things to bring us strength of conviction. 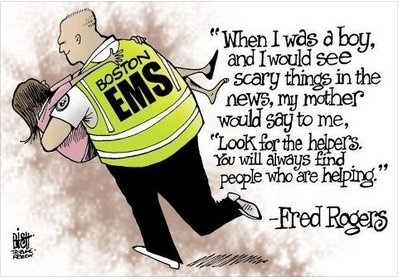 Those responders ran into the fray to assist those who were suffering. God allowed their heroics to be noticed and appreciated, thereby strengthening us all. We know that when the going get tough, we are called upon to be stronger and it is like exercising our free will….with repetition comes strength…by repeatedly aligning our free will with the Will of God, our faith is strengthened and we find peace.